Vytautas Miskinis: Bio & Choral Music | Santa Barbara Music Publishing, Inc.
Vytautas Miskinis (born in 1954) is the Artistic Director of the Azuoliukas Boys’ and Men Choir, Professor of Choral conducting at the Lithuanian Academy of Music and President of the Lithuanian Choral Union. He graduated as Choral Conductor from the Lithuanian Academy of Music in 1976. For several years he conducted the Kaunas State Choir and Vocal Ensemble Museum Musicum. With the choirs he has won prestigious awards at numerous National and International competitions. Currently Mr. Miskinis is an Artistic Director and Chief Conductor of the All-Lithuanian Choir Festival. 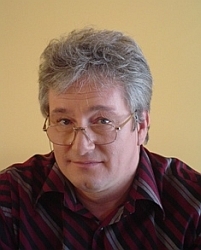 Vytautas Miskinis has lectured and held seminars on the subject of music education and conducting in Lithuania and abroad, and has participated in numerous national and international choral events as composer and advisor. He has composed aproximately 100 religious a cappella motets, thirteen Masses, a Magnificat, and aproximately 300 secular songs which are performed by choirs throughout Lithuania and the rest of Europe. His compositions are published in Lithuania as well as in France, Germany, Italy, Spain, and the USA. Vytautas Miskinis has 1 titles published with Santa Barbara.